Lost volkswagen keys for the key machine are no problem! Today saw us travelling down to Sennen which is near Penzance and Landsend it’s as far as you can go in cornwall without getting wet. We were carrying out work for some people down on holiday from London on behalf of the AA, they had unfortunately lost there volkswagen car keys whilst out walking in a field with little hope of finding them. After arriving we picked the vehicle to gain entry, and then decoded the lock, that information is then fed into a computer program to confirm that we have an exact match of the original volkswagen mechanical blade. Once this is confirmed the information is sent directly to a computerised key cutting machine which cuts the blade exactly to the code number. 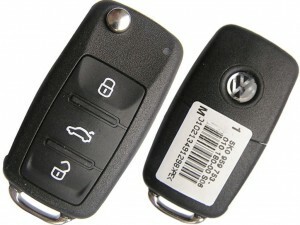 We then check the operation of the key in the vehicle to ensure its correct, after that we set about the car key programming itself, we firstly program the Volkswagen transponder chip which is contained in the flip, once this has been matched to the vehicle security system we then program in the volkswagen remote which controls the alarm and the central locking system. At the key machine we keep a good stock of the common volkswagen keys and remotes in stock, these people were very glad we did as they had been told by the dealer that they would have a 10 day wait for them to order in a key and they would also have to have the vehicle recovered to them at further expense. 24 hour emergency gain entry and or faulty lock replacement for doors and windows on any type of commercial building. Contract 24 hour, 7 days a week emergency assistance. New ownership / tenancy lock change for insurance or general security. Contract maintenance and repair of lock systems. General lock replacement or repair.